This past weekend was an awesome weekend spent on a retreat. It was the starting place of the next great chapter in my spiritual journey. So much took place, my mind is still processing it all. I will be writing more on that later after things have percolated a little bit longer. This afternoon I need to focus on another train of thought. What I realized this afternoon is that the evil one’s darts come quickly and his attacks can come at a moments notice. This is not new information, or even a new revelation for me. It did manage to creep up on me with absolutely no warning though. My guard was down, which is never a good thing. I was catching up on Facebook because I was offline for the most part while retreating. And that is when I saw it. It was a picture filled with wonderful, God seeking people. The joy of a wonderful weekend spent together forging lasting connections is evident on each precious face. And then BAM! The darts begin to fly. I find myself extremely opposed. The attack is fierce, its aim perfectly tailored for me. I am immediately distracted from all of the good of the weekend and immediately focused on the image of myself in that picture. He holds back no punches as his darts hammer into my brain directing my eyes to my form and whispering”look at that giant blob in the picture.” Look at that person! How can anyone take her thoughts seriously? She obviously doesn’t even take herself seriously or she wouldn’t be so disgustingly obese. She needs to find some self-respect and a lap band. The object of these cruel and vicious thoughts is the woman in purple in the front row. Me. In my mortification, the evil one now begins to use me as a weapon of destruction towards myself. I blindly start to reach out to someone, anyone, that will validate that incredibly chubby woman in that picture is not me. Enter Maximus, bless his little heart! I show Maximus the picture that is now evoking feelings of worthlessness and ask him, “Why am I always the biggest person in every picture? It doesn’t make sense! Why am I that large? I try so hard to eat right! Why do I always look like the only large person in every single picture? Do you see any other bigger people? ” Not my finest moment, I will admit. I am trying to console myself by trying to identify someone else so that I am not the only one lost and alone. His response? Priceless. “Well, not as big a you….” and then utter silence as his eyes grew very large and very round “…..I mean not as cuddly as you!” Followed by intense giggling. He quickly tries to make amends by saying, “it’s not funny as in haha funny, but funny as in I can’t believe I said that funny.” Followed by five more minutes of uncontrollable laughter. At that point I realized how quickly the evil one strikes. I am confessing all of this freely to anyone that will take the time to read it. In my human weakness, to cover up my own inadequacies and shame, I tried to lash out by looking for physical imperfection in others to make myself feel better. My petty, weak thoughts a result of my own brokeness intent on tearing down another precious creation of our loving God hoping to make myself feel better. Reverse body shaming at it’s finest. My hypocrisy abounding. I refuse to be used as the evil one’s number one weapon against myself anymore. After asking God to help me, he showed me how far I have come by placing positive thoughts in my head to replace the negative ones. So if you have stuck with me this far through my low, celebrate some of my triumphs in this battle of the bulge with me now. Since writing my initial post about my weight struggles I have become ten pounds lighter. That is nothing to sneeze at! It is only the beginning of a long journey, but a weighty one. I shed the equivalent of a large sack of potatoes or a small Thanksgiving turkey or two bags of sugar. I am also winning the battle in my struggle with carbonated beverages. Although still unclear on what I will drink going forward, I am proud to proclaim that it has been over a week since I have consumed a diet soda. Water, ice tea, and coffee have been my beverages of choice. Truth be told, I could really go for a Dr. Pepper 10 right now. This summer marked another incredible first for me. 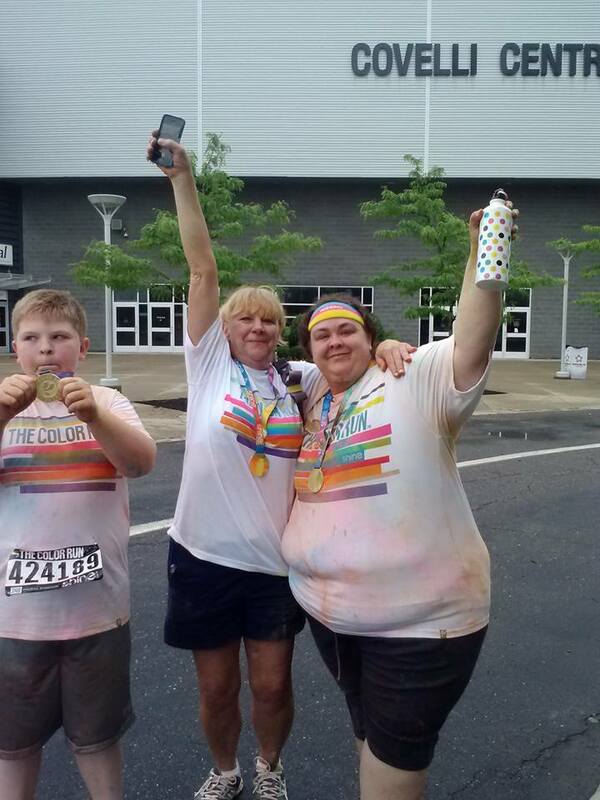 I participated in a 5K Color Run and finished it!!! Along with my mother and son. Such an awesome achievement shared with two of my greatest supporters! God has indeed been faithful to me as he leads me in my healthier life style pursuit. Yoga is next on my list of physical firsts to try. Another blessing that has come out of the wonderful retreat this past weekend. Perhaps there will even be a picture or two of that eventually. Spiritual Warfare is real. In moments of great spiritual awakening the army of darkness will strike to distract you from the purpose you were created for. They do not play fair. They will exploit any human weakness they can get at you with. Not because they are out to get you. They could care less about you. The army of darkness attacks because the evil commander’s goal is to destroy our heavenly Father. We are all beloved children of God. I can’t promise that I won’t become discouraged as I continue to move forward with my weight loss struggles. However, I can say with the utmost confidence that my Father in heaven delights in me exactly as I am. He is my strength, my salvation, and my shield. When the darts of evil attack me he will protect me always. I am safe and secure in the arms of my Savior, Christ Jesus.